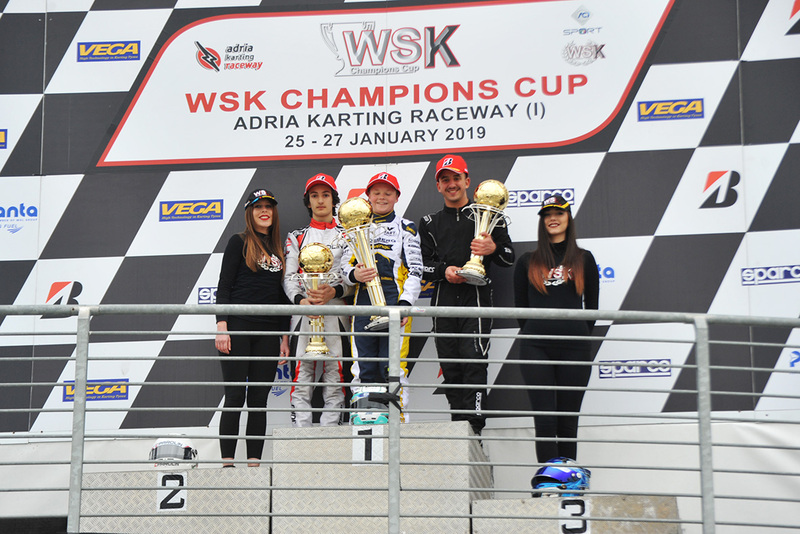 The weekend of WSK Champions Cup at the Adria Karting Raceway ended with some interesting new drivers shining along their path in International karting. 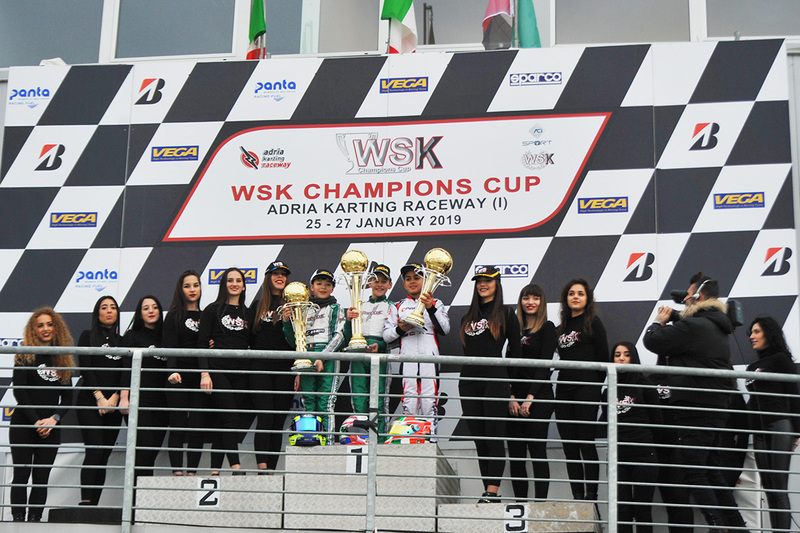 Some new name emerged in every category, as usual in a discipline like karting, that saw WSK Promotion starting its 14th year of activity. This weekend gone into the archives, the focus has already switched to next weekend, as the same circuit in Adria will celebrate the opener of WSK Super Master Series, that will run the first of the four rounds of this series. 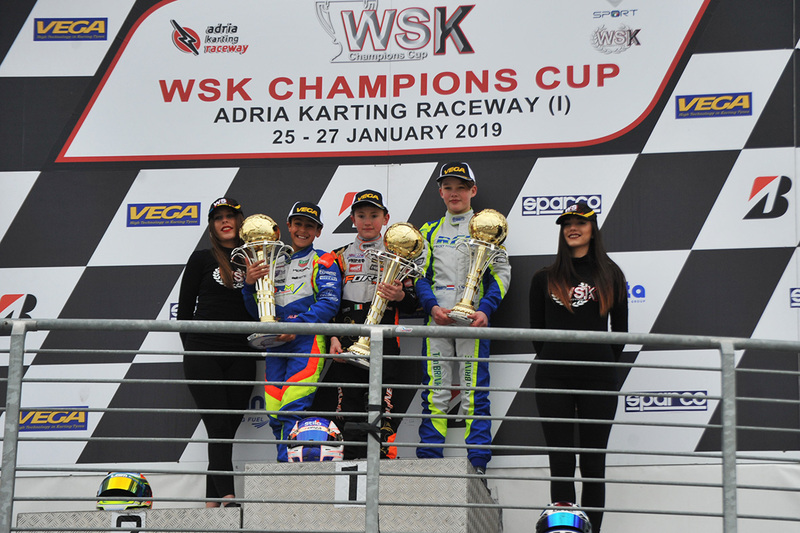 Top marks for Taylor Barnard in OK.
Taylor Barnard completed his apprenticeship in OK Junior winning the WSK Final Cup at the Adria Karting Raceway last November. Today, such a short time down the road, the British driver Taylor Barnard (KR-Iame-Bridgestone) proved to fully deserve his promotion to the higher category winning the WSK Champions Cup in OK. Started from the pole position after winning the Prefinal, Barnard managed the lead and won the race from a very good Gabriele Minì (Parolin-TM). The Italian driver, also at his maiden race in OK, had to bounce back after losing some positions early on, managing to clinch second in the closing stages. The Italian Cristian Comanducci (Tony Kart-Iame) ended a positive weekend in third place. Alex Dunne grows and wins in OK Junior. The Irish Alex Dunne (Exprit-TM-Vega) had a rolling start to the new season and set the benchmark in OK Junior, winning an eventful Final. Always among the top three, Dunne found his way past the Italian Andrea Kimi Antonelli (KR-Iame-Vega), who was leading the race after starting from the pole position. The Irish kept the lead of the race all the way to the flag, while behind him the fight for P2 involved the Aussie James Warton (FA Kart-Vortex) and Antonelli. The sting was in the tail though: the duel between the two cost both their position, as the British driver Arvid Lindblad (Exprit-TM) and the Dutch Thomas Ten Brinke (FA Kart-Vortex) eventually got past both. These latter two seized the moment and respectively claimed P2 and P3. Filaferro on top of the podium in 60 Mini. Novelties also in category 60 Mini. A new driver emerged as the one to beat: the Italian Andrea Filaferro (Tony Kart-TM-Vega) capitalized on the good start from the second row and installed himself on top of the Final overtaking the poleman from Russia Maksim Orlov (Parolin-TM). The two kept fighting exchanging positions on top early on. Filaferro eventually put in some very effective driving and won the race, while Orlov had to concede his position also to the Italian Francesco Marenghi (Tony Kart-TM), who ended second. The race has been exciting until the very end when Arab Emirates’ driver Rashid Al Dhaheri (Parolin-TM) got past Orlov and claimed P3 at the end of a comeback race started from the fifth row of the grid.